Maybe you cannot afford the lakeside home of your dreams that costs well over $1 million…yet. That’s okay. 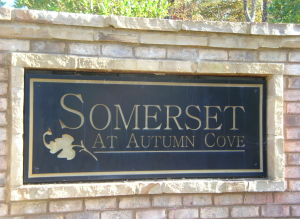 Somerset at Autumn Cove homes start in the low $220s and offer the amenities and views of the lake without breaking the bank. Eastwood Homes is still building out the neighborhood, which offers a community pool, walking trails and a boat storage area. If picking out one of 11 floor plans and design details isn’t your cup of tea, there are currently 13 homes on the market there that are move-in ready. Seven of those listings are already under contract. The highest list price is currently $850,000 and lowest $226,990. The average sold price is just over $321,000. 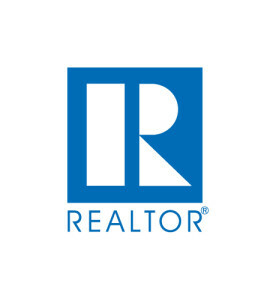 The number of homes sold per month is approximately 1.7 for the last 12 months. That number is up to 2.3 for the last 3 months. The average sales price and price per square foot are also trending upward to just over $320,000 and nearly $112, respectively. 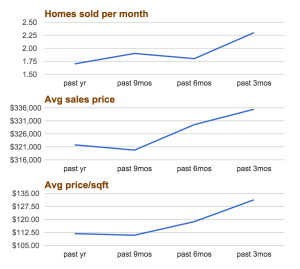 Somerset has about 7.8 months of inventory on the market right now, given that fewer than 2 homes per month are selling. Established Autumn Cove at Lake Wylie has just under 3 months of inventory on the market. Clover and York County both average about 7 months of inventory.